Our newest Department Lead in Training. Elizabeth is a graduate of Cathedral High School and is working while taking on-line college classes. Growing up Elizabeth worked with her father, a professional handyman, who gave his daughter a great foundation in understanding hardware. Forrest is our go-to person for all things in shipping and receiving. He handles deliveries and our warehouse logistics. Forrest is a country guy that loves video gaming. He is a graduate of Sauk Rapids-Rice High School.
. Jean is an all-star in the world of hardware. In her 44+ years of experience between her first job and Handyman's, Jean has a strong base to draw from when it comes to the hardware business. She is also the person to see about all things paint. Like many of our staff members Jean is also a graduate of Sauk Rapids-Rice.
. Pat is a third-generation family member here. His titles include Bookkeeper, Accounts Receivable Manager and IT Consultant. Like his father and aunt, Pat's second home was Handyman's. Pat has a business degree from the Collage of St. Scholastica, with a minor in Accounting. It has been more than forty years that Paul has been a loyal member of the staff at Handyman's Hardware. It was early May in 1976 when Paul started at Handyman's. Over the years Paul has helped thousands of people find the parts they were seeking. Paul gets a kick out of helping people find answers to their projects by drawing out their needs to come up with a solution. Over the years Paul's responsibilities have grown from the day to day interactions in the store to spending part of his time outside the store and serving our customers in schools and industry. In this role Paul keeps his customers stocked with the day to day items they need so they can spend more time doing their work without having to chase down supplies. Born in Central Minnesota Tom is a graduate of Cathedral High School, and he lives west of St. Cloud on Interstate 94 with his wife Kathy. At Handyman's Tom oversees our vast plumbing department. From parts to fix a dripping bathroom faucet to parts that help keep the heat on in large apartment buildings, Tom can most likely assist you. Along with his responsibilities as our plumbing expert, Tom is also the person that will repair your window screens. Though Tom would never admit it, I am fairly sure Tom has a photographic memory, that makes him wicked good at what he does. Austin is another one of those Robotics enthusiasts. Austin has worked here two seasons now as a part time Support staff member. As a senior he is pointing himself to expand on the robotics engineering and design. Austin is the other one of the Robotics enthusiasts from Sauk Rapids Rice High School working here. Adam has worked here two seasons as well and spent this summer restructuring our warehouses. Ashley was born and raised in Sauk Rapids and is a 2011 grad from St. Cloud State University. 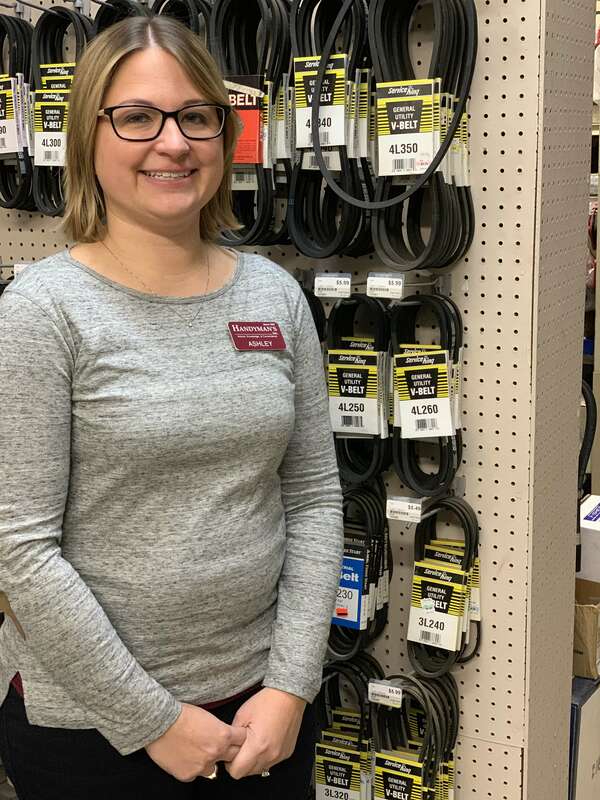 Over the past 8 years Ashley has worked for Enterprise Rent A Car in sales management, logistics and customer service and has moved all over Minnesota and Wisconsin. In 2013 Ashley married into the Severson family. She is excited to be back in Central Minnesota and to be working in her husband's family store. When she isn't working, Ashley loves spending time with her husband and son. She is also a wine maker and a fan of all things wine.